John Beiswenger is suing Ubisoft for allegedly basing the Animus on his ideas. With the recent announcement of Assassin's Creed 3 still sneaking its way around the internet's collective consciousness, there's never been a better time than right now to attempt to sue developer Ubisoft for basing this successful franchise on a book you wrote in 2003. As luck would have it, that is exactly what author John Beiswenger is trying to do. Beiswenger contends that the Animus, a genetic memory access machine which stands as the center-piece of the Assassin's Creed games, borrows far too liberally from a similar device he dreamt up in his 2003 novel Link. As his novel was the first to feature specifically "the conception and creation of a link device and process whereby ancestral memories can be accessed, recalled, relived, and re-experienced by the user," he's called dibs. Beiswenger is reportedly attempting to block the release of Assassin's Creed 3 until the case is resolved. In the complaint, Beiswenger also draws attention to how both Assassin's Creed and Link spend a lot of time talking about religion, the Garden of Eden, assassins, and "good vs. evil" factions attemping to control memory devices. 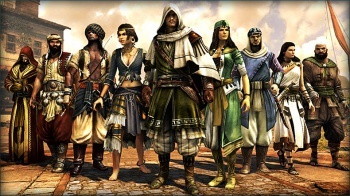 The immediate question is this: How much do Link and Assassin's Creed really have in common? According to its Amazon description, Link is mostly about a scientific discovery which "suggests that at the functional center of the nucleus of every cell is an atemporal Particle of zero mass and infinite capacity for memory a biological singularity [sic]. The same Particle is a component of every cell in the body. It is the "fabric of the soul."" The description continues: "The author lets the reader be present right alongside the scientists as they uncover some of the very secrets of Creation, and while test subjects are taken back in time to recall ancestral memories, a process key to proving the existence of the human soul." I have to say, this isn't sounding very Assassin's Creed-esque. Correct me if I'm wrong, but the Animus is a machine based purely on biology, no? The memories are genetic in nature, rather than being part of some zero-mass particle party. Nobody's on a mission to prove or disprove the existence of the human soul. Religion is mentioned particularly in the first Assassin's Creed because it, well, is set during the Third Crusade. As for the rest of it, we'll keep an eye on Beiswenger's case to see if it goes anywhere. Have any of you read Link before? A brief preview of its opening pages is available on Amazon, and I have to say that they don't bear any resemblance to Assassin's Creed. Not one assassin becomes comically involved with a well-placed hay bale; the "Link" is a device which allows someone to insert their memories of kayaking into a virtual reality kayaking experience, rather than cut about Venice hundreds of years ago. Link fans, make yourselves known!